1300 Jews on Temple Mount Signal End of Exile and Beginning of Joyous Redemption on Ninth of Av | Have Ye Not Read? This past week over 1,300 religious Judaics ascended the Temple Mount on the Ninth of Av, which is our August 1st. According to this news article, this is supposed to be the most Jews gathered on the Temple Mount at one time for the past nearly 2,000 years. The Judaics are “joyous” because, now that Israel is back in control of the Temple Mount (however temporarily), and the Muslim Waqf is not supervising visitation to the mount (again, at least temporarily), more Judaics are able to ascend to the mount to pray, unrestricted. What’s so important about the Ninth Av? The first temple is said to have been destroyed on that date in 423 BCE. And the second temple is said to have been destroyed on that date, five centuries later, in 70 AD when the Roman army sacked Jerusalem. Many other catastrophes have taken place on that date, as well. So it’s regarded as “the saddest day in the Jewish calendar” (Wikipedia). Which is precisely why the Orthodox religious Judaics are so happy about their latest Ninth of Av visit to the Temple Mount. They’re viewing it as a signal of the “end of Jewish exile” from the mount, and the beginning of a “joyous redemption” in which their Third Temple will be built, and their “messiah” will arrive onto the scene. And since many of the Judaics who ascended the mount this week were relatively young, the rabbis are likening this event to the children of Israel in the wilderness, when God forced the older, doubting generation to die-off before He allowed the younger and more faithful generation to enter the Promised Land. 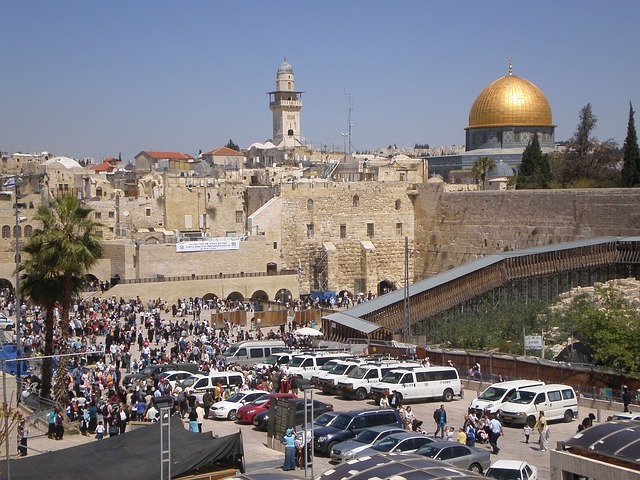 Of course, it’s talk like that – talk of building a Third Temple on the mount – that is not lost on the world’s Muslim population. The Muslims, meaning basically the entire Arab world, will view this as a blatant attempt to take the mount from them completely, and re-establish Judaic worship there in place of Muslim worship. I’ve repeatedly shared in similar posts and emails that the deadly wound of Revelation will most likely take place in Jerusalem, in a controversy between the Muslim world and Israel over that Temple Mount. I’ve also repeatedly stated that I don’t believe this is the time for it. He continued, “The holy site hasn’t seen so many Jews gathering together on Tisha B’av since the Second Temple was destroyed precisely 1,947 years ago… A person who merits seeing the beginnings of the Third Temple, God will put joy into his heart, and that is what I felt when I saw the crowds of young people on the Temple Mount,” Rabbi Ariel explained. He further admitted that current events are reflecting this spiritual principle, referring of course to the recent series of riots by Muslims over the restrictions the Israeli government has placed on their visitations to the mount since two Muslim gunmen murdered an Israeli policeman there several weeks ago. So the Muslims know what the Judaics are up to. And the orthodox rabbinic Judaics who are celebrating with joy know it will only cause trouble with the Muslims, but think the time might now be right to make their move. According to the news article, Jordan’s foreign minister, Ayman Safadi, described the Judaic ascent to the Temple Mount as “extremists who stormed the Al-Aqsa today.” So while the mood is joyous on the Judaic side, there is nothing but anger on the Muslim side. We’ll have to watch and see what happens from here. My guess is that cooler heads will prevail, and the Israeli government will tamp-down the messianic fervor that seems to be gripping the Orthodox Judaic rabbis. But it remains to be seen. So as I’ve constantly admonished since this event began taking place some weeks back, keep your eyes on Jerusalem. That’s where all of the action is, and one way or another, always will be.